"One day your life will flash before your eyes. Make sure that it's worth watching." Can you beleive I am moving again? I sure can't! I have only been in my current apartment for about 3 months and already I decided it's not going to work out. The girls that I live with have turned out to be quite mean and just party all the time. When I am getting up at 8am for work and to drink a coffee they are still drinking beer. That reason, among with a bunch of others, made me look for a new place for the coming year. And, I found one, right back in my old neighbhorhood of Gros. I have been busy packing and taking my stuff back across the river. The bar where I used to go for coffee almost every day (and where I still frequent) is right across the street and the bar owner told me I could put my things in his storage area in the bar basement to make the move easier, so that's what I have been doing. Little by little I have been taking boxes and such to the bar, always rewarding myself with a beer with lemon after I have lugged something all the way there. In the meantime, I am staying at Joseba's house - so as to not get woken up every morning at 6am when my roommates come home from partying. Joseba is on vacation right now, so I have the house to myself and am quite enjoying the relaxing time. More to come on that in another blog! I haven't moved in yet, so no pictures yet, but thought I would entertain you with some photos of the Main Post Office while we were on the topic of addresses. Once I move in, I will get you guys some pictures and the new address! 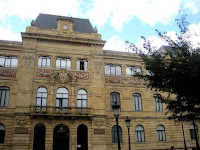 In the 1800s, the Arts and Crafts School of San Sebastián used to house the building where the Correos (Post Office) now is. When a new school was built, the post office moved in and in 1960 they tore off the roof and replaced it with what now is a beautiful stained glass tribute to Donostia. 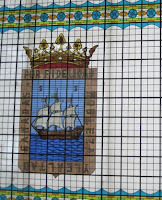 The glass reads (from left-side going clockwise): Won for fidelity, nobility and loyalty. The words surround the symbol of the city - the boat with the 3 sets of sails and the S and S above. I guess my ship will be setting sail soon enough, so I will try and enjoy the Old Part as much as I can while I still pay rent in it! A small-town American returns back to the good ol' US of A after 4 years in the Basque Country and brought the boy in tow. Now she shares what it is like to see your own country with new eyes and all the exciting ventures that go along with calling a new place home! No sack lunch for us! Click on a destination below to read my blog about it!